The Weather Channel’s very own Jim Cantore was among the first three honorees inducted into the 2018 Weather Hall of Fame at the National Weather Museum and Science Center in Norman, Oklahoma on Saturday, October 20th. 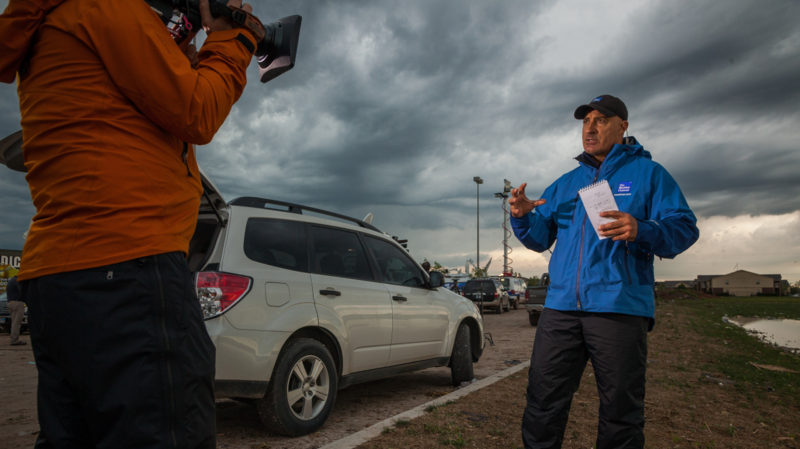 As one of the most recognized faces in weather, Cantore embodies the passion and knowledge of The Weather Channel. If you’ve ever seen him in thundersnow, you know this to be true! Not only is he the weather authority viewers turn to when their forecast turns dire, but he has been a guiding voice during every major weather event of the past 30 years. Tornado? Been there. Blizzards? Done that. Hurricanes? That’s his bread and butter. From Superstorm Sandy to Hurricanes Katrina, Irene, Harvey, and most recently Florence and Michael, Jim has always brought tremendous and trustworthy storm coverage to millions of homes across America. Before, during and after weather events, his live reports and insights keep the public safe. When not in the field, he covers the latest forecast and weather news on AMHQ weekday mornings, where he lights up the screen with his zest for life and weather. If you’re a fan of The Weather Channel or weather in general, there’s a good chance you’re a fan of Jim Cantore too. Nobody can cover the weather quite like Jim, so to us, we are not surprised in the slightest he was inducted into the Weather Hall of Fame. Cantore was honored alongside Dr. Elbert W. (Joe) Friday, Jr., retired director of the NOAA National Weather Service and Thomas J McNellis Jr., senior manager with Lockheed Martin. Pass along your congratulatory messages for Jim below! Mini Meteorologists Visit The Weather Channel Studios! Congratulations on this well deserved honor, Jim. I miss watching you (ever since Verizon FIOS took away my Weather Channel). Blessings and continued success as you chase the storms and keep people safe! Congrats Jim! You have been my favorite since the 1990’s when I was a kid! Congratulation Jim! My Grandma so loved watching you on the Weather Channel and now I do too. Congratulations Jim! I have been watching you for decades and you are the person who turned me into a weather geek. I have learned so much about the weather from you over the years. Please don’t ever retire LOL! Big congrats to you, Jim! You’re always a lot of fun and you have so much class in addition to your weather knowledge Jim! Well deserved, Jim! Yours is the voice I listen for in the morning and always during extreme weather. Thanks for taking care of us with the love and enthusiasm you have for your life’s work. Awesome! Have watched you for all those 30 years! Here’s to another 30! Congragulations on you honor. You have always been one of my favorite weather people. You go above and beyond. Congratulations Jim and it’s about time you got honored for all the hard work you have put into bringing the weather to homes across the country. Just keep up the great work and stay safe out there!! Congratulations on your induction to the Weather Hall of Fame! There’s not a guy more deserving than you for the honor! Congratulations Jim! Well deserved!! We’ve been watching you for years on the Weather Channel. Your excitement and passion for weather is appreciated by all of us weather fans. Thanks for keeping it trustworthy, interesting and entertaining. Love that thundersnow! Congratulations Jim – it’s about time! Couldn’t happen to a more deserving person because you’re everyone’s favorite weather expert! Congratulations Jim, you earned your place in history. Thank you for all I have learn watch you on TWC. I remember the snow storm in the south and the boys giving you a hard time, you took the show off out without missing a word. I was watching during the thunder snow and I was just as excited as you when you had six that night. I worried about you during Katrina, and I know what a wonderful person you are to stay behind at that nursing home to help the elderly when the staff left. You are a hero in my book. Congratulations Jim! Well deserved! I’ve watched you on the Weather Channel forever, you have always been my favorite! Congrats Mr. Cantore! Very well deserved!!! Congrats Jim! You so deserve this honor!!! Congratulations Jim! So well deserved! Way to go. I can’t think of anyone who deserves it more. Congratulations Jim! You are one of the reasons I’ve become so interested and enamored with weather and the Weather Channel! I can think of no better candidate for the inaugural cohort of the Weather Hall of Fame. Congrats, Jim! Congratulations Jim, You have earned this honor in every way possible. You are a wealth of knowledge when on the air and show the practical side of the weather. I cannot say enough about what my grand kids have leaned about weather from watching you yet alone me. You keep it very simple but complete. Congratulations Jim! You have such a passion for the weather and it shows in all you do! Well deserved! In high school I thought about being a meteorologist Watching you in my home state of Massachusetts,during a blizzard, reacting to “thunder snow” was incredible. Keeping us safe,informed and entertained at the same time! Congratulations, Jim! I’ve been a fan and watched you since you began broadcasting on TWC. Having lived in Florida for 37 years, you have been a mainstay in our household (also for my children and grandchildren). You are the face of weather and deserve this honor for which you have most definitely earned. Congratulations, Jim on your induction. You’ve worked hard over the years covering severe weather. Your passion for weather and your compassion for people caught up in severe weather is admirable. Your deserve this honor immensely. Congratulations on your induction into the Weather Hall of Fame! It is well deserved. You are not only knowledgeable about the weather but you appear to be a man who enjoys is work–in fact, it appears you have received a “calling” or “vocation” from weather gods and have responded to it great vigor. I have followed your career at the TWC from its beginnings and have enjoyed every minute you have been on the air. WELL DESERVED!! Congratulations Jim! Well deserve honor. My favorite Meteorologist hands down. Thank you for making the weather interesting. A well deserved honor. Congrats Jim. I watch AMHQ every morning!! Congratulations, Job Well Done! I keep the weather Channel on during the day every day! Congrats to you, Jim Cantore! No one deserves this honor more than you! I’m thinking this honor is almost as exciting for you as thundersnow in a blizzard! I have watched you on TWC for more years than I can count! Always impressed with how easily you explain the most complex weather systems so that us Weather Geeks can understand them! Kudos to you! Hope to continue watching you cover all kinds of weather (especially the severe kind) for many years to come. Congratulations, well deserved!! The Weather Channel is always on at my house, and you’re one of the reasons why. Soo happy for you on your induction into the HOF. But anyone who watches you is not surprised and you are soo deserving of this. As a Volunteer for the American Red Cross, I have seen you in action on disasters and you are amazing. We would be as ecstatic if you would come and speak at one of our Disaster Volunteer Meetings in Murfreesboro, TN as you are for this honor. CONGRATULATIONS….well deserved. Congratulations, Jim! Your enthusiasm is contagious and your professionalism is unsurpassed. You are an inspiration, a lofty example of what all of us amateur weather geeks aspire to. You certainly deserve the honor. No one can dought your desire to bring the most accurate and helpful forecast. It is apparent you sincerely desire to help protect people during stressful weather. It’s also intertwining to watch how excited you can get with thunder snow. Congratulations! This is a well deserved honor. Thank you for keeping us informed during dangerous weather conditions. Your passion and excitement for weather has inspired so many of us to learn more about our weather and climate. Jim-Congratulations! Well deserved! I love watching you on TV with your zest and exuberance for the weather! I actually saw you in Punxsutawney, PA in February and you were gracious enough to take a picture with me that I show to everyone! You are AWESOME!! Congratulation on your being recognized for being as awesome, dedicated and talented as you are. I remember that first thunder snow in Boston many years ago. You had us so excited! Hope you keep on being the great and awesome forecaster that you are. Congratulations Jim Cantore on this well deserved honor. You surely know how to bring weather alive for all us weather geeks. There are many times I am thinking, “wish I was there to see that weather phenomena.” Thanks for your great coverage of these beautiful weather events. Congratulations and thank you for your dedication and passion for answering the call to your life’s vocation! Well deserved recognition! Well deserved! Great honor for a fantastic meteorologist and gentleman! Congratulations Jim! I will never get over your reaction to thundersnow in Chicago and in Cape Cod, it was so entertaining!